Coral reef restoration is not just a hot topic in the Florida Keys. It's a critical step in preserving the economy and the region's way of life. Universally, the Florida Keys and their coral reefs are synonymous. It's difficult to fathom a world where one would exist without the other. However, that possibility is always nudging just around the corner, if we don't begin to take greater proactive measures with coral reef conservation and restoration methods. Man, nature, and other circumstances have all played a role in the coral reef destruction. Insidiously they've taken their toll on the delicate coral reefs, a vital part of the Florida Keys ecosystem. It's critical that we protect this valuable resource so that future generations may enjoy the beauty, wonders and benefits of the coral reefs in Florida. Not only do we need to understand the importance of these living reefs, we need to realize that something can be done to help with coral reef restoration. The Florida coral reefs stretch 358 miles along the Atlantic coast. They have taken 6 - 10 thousand years to build and they consist primarily of two types of coral. Stony which are the hard foundation blocks of the reefs, and gorgonian coral which are the soft, wispy, and lacy types of coral. In the past few decades, a substantial portion of the reefs has been destroyed, with approximately 80% of the coral dying off in the Caribbean. In the Florida Keys, from 1996 - 2005, there was a decline of about 40% in the coral reef structure. All types of coral have experienced some form of impact, with some experiencing severer damage with slower growth rate than others. Most notable is elkhorn coral. This type of coral has been seriously affected by a bacteria found from the runoff due to a sewage treatment process. Unfortunately, most people are unaware that the coral reefs are alive. Even fewer understand the importance of coral reef restoration. They think of coral as something pretty that would look nice in their aquariums, not as something that has significant importance or impact. But these structures are actual living organisms. Each coral polyp is a separate small animal. They form colonies and build an external limestone casing. What you see on the coral reef is a colony of hundreds of thousands of tiny polyps. Each has its own structure, and is connected to its adjacent neighboring polyp. These coral polyps feed on nutrients that circulate through the water using their tentacles to trap the nutrients around them. Pillar coral feed during the day, but most of the other species are closed, only extending to feed at night. This makes night diving in the Florida Keys a totally different experience, because the fish are sleeping and the coral are feeding. Also active and feeding at night are other nocturnal residents such as moray eels, crabs, shrimp, octopus and spiny lobster. This change in 'scenery' is one reason why night diving is extremely popular, especially around places like Elbow Reef where there's also a light at the reef. The coral reefs are more vibrant and alive than people imagine. Not only are they comprised of the living coral organisms themselves, they're alive with a variety of other marine life. This is why coral reef restoration is so important. You're not restoring just a barrier, or a hard surface - you're restoring life and the foundation to other life. In the Florida Keys, coral reef restoration has become a primary focus for different groups. The goal is to repopulate damaged coral, specifically 2 main branching types that are faster growing and which are on the endangered species list. One is staghorn coral which looks like deer antlers, and the other is elkhorn coral which looks like moose antlers. In the Florida Keys, one of the healthiest pockets of elkhorn coral is at Horseshoe Reef near the Elbow. Each one of these coral stands, or groups of antlers are about 6 - 8 feet across and the area has numerous growth areas adjacent to each other. Since there has been so much devastation and die off of the coral, the elkhorn stands normally seen are only about 4 - 6 feet in diameter including the branches. An unfortunate phenomena that people are seeing and asking about is: "What is coral reef bleaching?" Coral bleaching is one of the factors that has affected the decline of the coral reefs. The coral bleaching occurs when the algae that's resides within the coral dies off. Since it's the algae that gives the coral it's color, when the algae dies the coral looks white. Other contributory factors to the coral's degradation include pollution, fisherman and divers damaging the reefs, strong storms, cold weather, invasive species such as the lionfish, disease, and shipwrecks. However, many of these conditions have existed as long as the reefs have. But after thousands and thousands of years, the reefs are suddenly dying and they're dying at a rapid rate. One of the primary reasons behind the fast die off of the coral reefs is due to the sudden decimation of about 99% of the diadema sea urchins. These urchins were critical to the overall health of the coral reefs as they consumed the algae covering the coral. Without the urchins acting as a cleaning agent, the coral reefs were overtaken with bad algae which not only choked them, it made coral spawning less productive. Spawning typically occurs in August and September during the full moon and varies by types of coral. When the coral spawns, and the new coral is in it's larvae stage, they require a place to land so they can grow. If the reefs are covered with an algae slime, the larvae have nothing to grip on to. The ultimate coral reef restoration goal is to plant the coral, while placing a certain number of sea urchins with them. The problem facing everyone involved in coral reef restoration, is that the larvae stage of the sea urchins is incredibly delicate. Scientists have no problem breeding the sea urchins, the challenge is sustaining them through their larvae stage. The coral reefs act as breeding grounds and shelter for numerous species of Florida fish. They are in fact a juvenile holding area or kindergarten facility. Without the safety net of the coral reefs there would be a loss of reef fish population which would adversely affect the recreational, and commercial fishing industry. 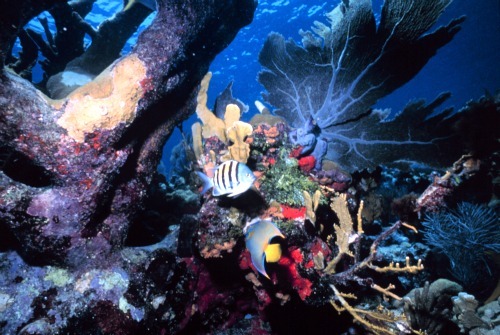 The loss of the reef system would also adversely affect the Florida Keys diving industry. This would have a pronounced negative impact on the Florida Keys economy. Even though the Florida Keys coral reefs are not true barrier reefs, they do provide a cushion for the land, protecting it from the pounding, heavy waves of the ocean. Without the reefs, or if an even larger portion of the reefs are lost, the pummeling action of the waves will cause substantial land erosion. For the smaller islands this could be catastrophic. Coral reef restoration is an extremely critical step that's vital in saving the economy and marine life of the Florida Keys. By selecting staghorn and elkhorn coral, two species that are easier to replant and grow at a faster rate, coral restoration projects are able to successfully repopulate areas once thick with coral. Coral reef restoration is a labor intensive, but worthwhile process. Numerous techniques for growing coral have been tried, and certain ones have proven to be faster and more successful. Some of the coral restoration techniques that have been applied involve using concrete blocks with PVC tubes that have a pedestal on them. Each piece of tiny coral is then epoxied onto it's own small little base. A clotheslines technique has also been utilized. Several strands of line are run between two upright lines and the coral fragments are then hung from the 'clothesline'. Another coral growing technique involves using a vertical PVC pipe which acts as a central trunk, like a tree in the middle. Rows of horizontal PVC pipe are run off of that main trunk creating a branching format that somewhat resembles a Christmas tree. This technique has proven to be quite successful and has had the most rapid growth rate for coral. The process starts off with a nubbin about the size of the last joint on a thumb. The nubbin is then hung on a line and then attached to a branch of the tree. Within a year or so that nubbin typically reaches the size of a baseball. In 2 years it has grown to be about the size of a volleyball. Through 'voluntourism,' certified scuba divers interested in coral reef restoration are able to make a beneficial contribution. The Coral Restoration Foundation located in Key Largo offers several different options for Florida Keys divers. You can participate in a 1 day class where you learn about reef restoration and get to tour a previous restoration site. If you have time, you also have the opportunity to participate in a 2 - 3 day program where you would actively be involved in the coral restoration and maintenance process. For more information on these coral restoration dive programs contact the Coral Restoration Foundation direct at 305-767-2133. There are also eco tours available up and down the Florida Keys that help teach the importance of protecting the local flora and fauna. Florida Keys scuba diving and snorkeling tours are run by a number of different eco tour companies. 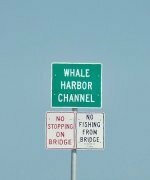 These eco tours is another way you have of becoming more acquainted with the spectacular Florida Keys coral reef and the problems it faces.